The Corsair K63 is one of the cheapest mechanical keyboards that Corsair makes, thanks to it being a tenkeyless design, where the whole numpad section has been chopped off. It’s essentially a plastic version of the K65, but with the addition of backlighting. And, this immediately makes it a more practical option than the K65. RGB backlighting may be mostly for fun but plain old single-colour backlighting is just downright useful. What’s more, in many ways the K63 is a match for the K65 when it comes to design too. Although it lacks the aluminium top plate of the latter, the simple black plastic finish looks good and the addition of a red plastic sunken section really sets off the backlighting. On the aluminium Corsair keyboards the backlighting can look a little messy as it just spills out onto the metal below. On the other hand, although the black section that surrounds the keys is slightly raised, it isn’t a fully protective surround that prevents the underside of the keys getting snagged. This is an issue that doesn’t seem to concern that many people, but I know I’ve broken a few keys this way so it’s something I’m wary of. In terms of extra features, you get a few extra buttons along the back that control multimedia playback, audio, the backlight brightness and the Windows keys. That’s actually an upgrade over the K65 which lacks the multimedia playback buttons, as well as the backlight control, obviously. Meanwhile, round the back there’s no USB hub or any other extras, and the cable is neither braided nor removable, unlike with the K65. But it is a plentiful 2.2m long. Looking at the underside, you get the obligatory four rubber nubs for gripping the surface the keyboard is on and a couple of flip down legs at the back, which also have rubber ends. The whole keyboard, despite being plastic is also nice and sturdy. Corsair has done a great job with the font on the keys. It’s large and clear making it easy to get your bearings with just a glance at the keyboard. Some more stylised fonts can be far less legible. As for those all important mechanical key switches, the K63 is only available with red backlighting and and matching Cherry MX Red keyswitches, so fans of tactile switches will have to look elsewhere. Otherwise the typing and gaming experience is as excellent as you’d expect of a quality mechanical keyboard, with you also getting 100% anti-ghosting and full key rollover. Corsair’s keycaps also feel great. Nicely contoured and with a soft-touch rubbery surface, they provide loads of grip, and in fact the spacebar even has a chunky checkerplate pattern for even more purchase. It does make a difference too. Your fingers feel more planted and secure compared to keyboards with conventional plastic key caps. Really the only issue when it comes to the performance of the keyboard is the lack of a number pad which is fine for most things but a pain if you’re ever entering loads of numbers into a spreadsheet, for instance. As for the software side of things, Corsair’s CUE software lets you assign macros to any key as well as create lighting effects, and it’s fairly simple and intuitive to use. So, this is a great little tenkeyless keyboard that has a nice balance of features and design. The only problem is, if you’re considering the K63 mainly because it’s just a cheap mechanical keyboard, well there are similarly priced options that offer more features and lose little in the way of quality. In particular, the CoolerMaster Pro L White springs to mind. 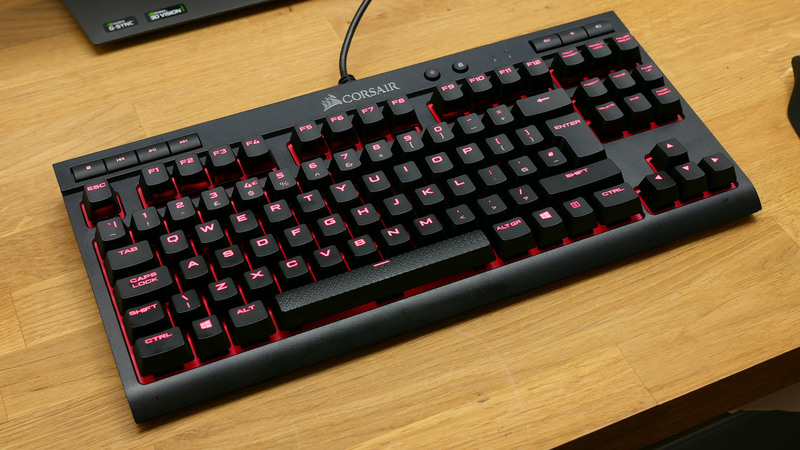 That leaves the Corsair K63 looking just a touch expensive. As a tenkeyless design, it’s a bit more competitive and I’d certainly pick it over the K65, just because it’s more practical. But overall not a bad option, just not a bargain.